We’ve visited the Akihabara Gundam Cafe twice thus far – in 2013 and late 2014. It’s close to Akihabara Station, so if you’re into Gundam, it’s a convenient place to stop and have a drink after a big day in Akihabara. 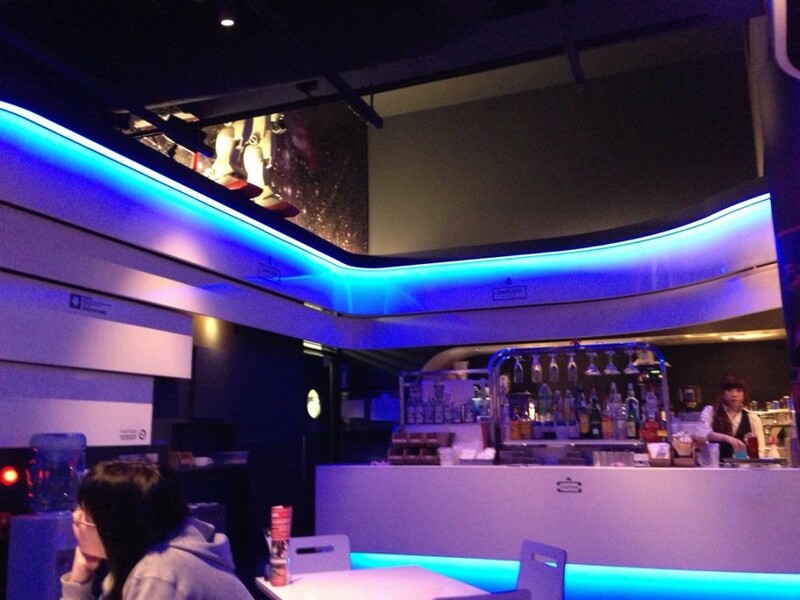 The Gundam Cafe bar, where you go to place and collect your order. 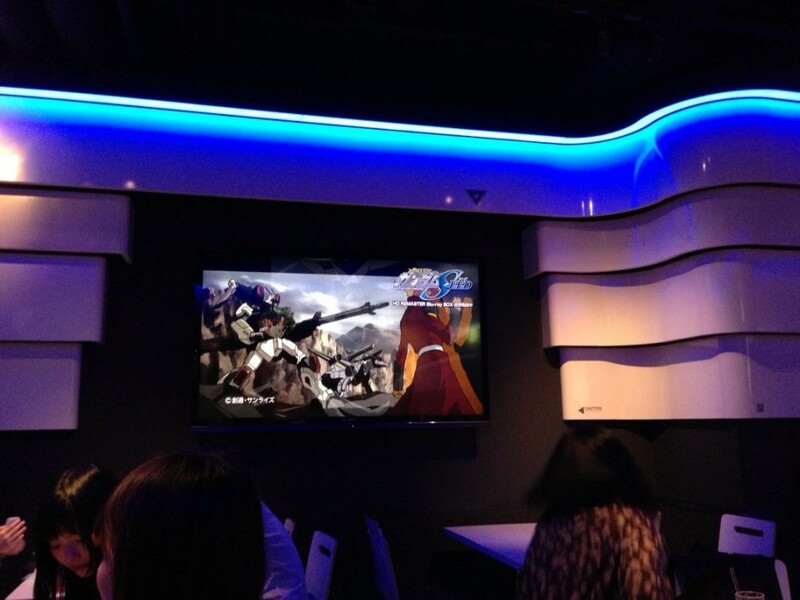 Inside the Gundam Cafe, various Gundam series are played on large screens while customers people eat and drink. Our experiences have been a little different each year. In 2013, waitresses came to the table to take our orders, and brought our food and drinks to us once ready. We were quite happy with our experience there that year, and enjoyed our food too. In late 2014, they had stopped doing table service, with customers having to order from the bar and bringing their own food and drinks to their tables on trays. We found that the staff were quite unfriendly the second time around, too. While you can order meals there, we pack a lot into our itineraries and at this point have only managed to fit in drinks and desserts (due to planning to have meals at other venues). Meals look reasonably good and are all under 1,000 Yen (about AU $10.55) – but I can’t comment on how they actually taste. Desserts range from 210 Yen to 880 Yen (about AU $2.20 to $9.30), and although they have changed the menu since we ate desserts there, we found that our desserts were quite nice. 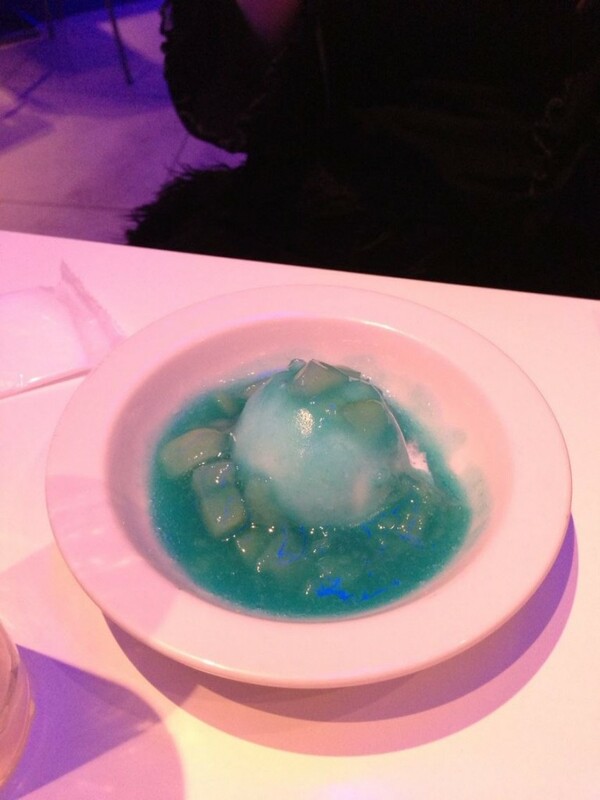 No longer on the menu, this was a dessert called Gouf Ice. It was basically a sorbet with a fruity sauce, and it was nice. They have several other similar, small ice-cream or sorbet type desserts on the menu now. 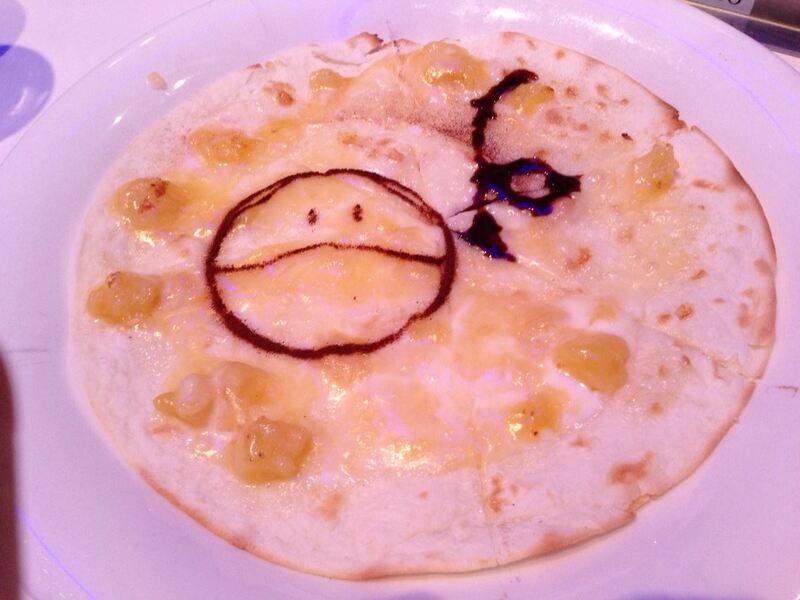 Also discontinued, this was a Haro pizza. I’d describe this as a banana pancake rather than a pizza. It was very reasonably priced and quite tasty. 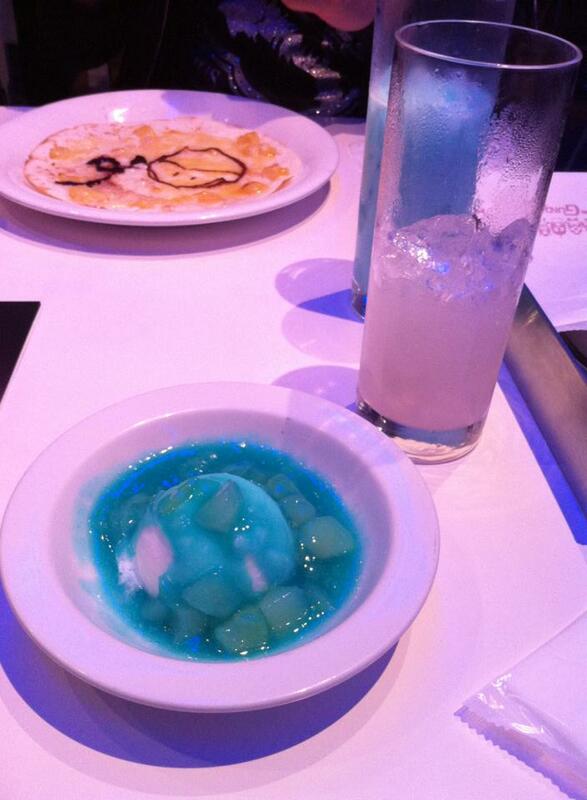 Back when waitresses took orders and brought food and drinks to the table, drinks just came with a Gundam Cafe napkin. These days, while you need to place and collect orders at the bar from the less-than-friendly staff, the good news for those who collect coasters is that cocktails now come with Gundam coasters! 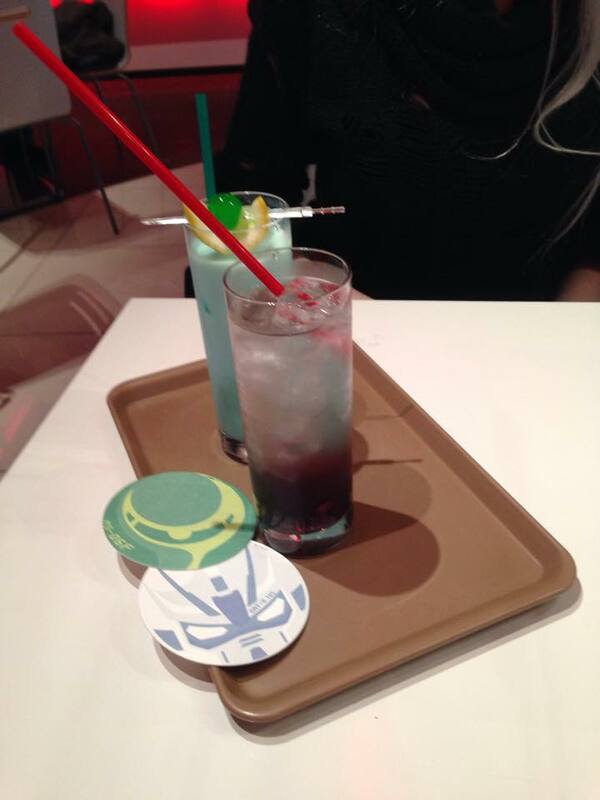 Themed coasters are common at themed cafes, so it’s good to see that the Gundam Cafe has included these. These cocktails are from the non-alcoholic section of the drinks menu, as alcoholic beverages are only sold from 5pm – with the exception of beer which is available all day. On the left is the Tieria Ade (spelling is probably meant to be Tieria Erde) – a lavender flavoured drink with grape jelly. It was 750 Yen (about AU $7.90), so awfully overpriced for what it was, even though it tasted okay. 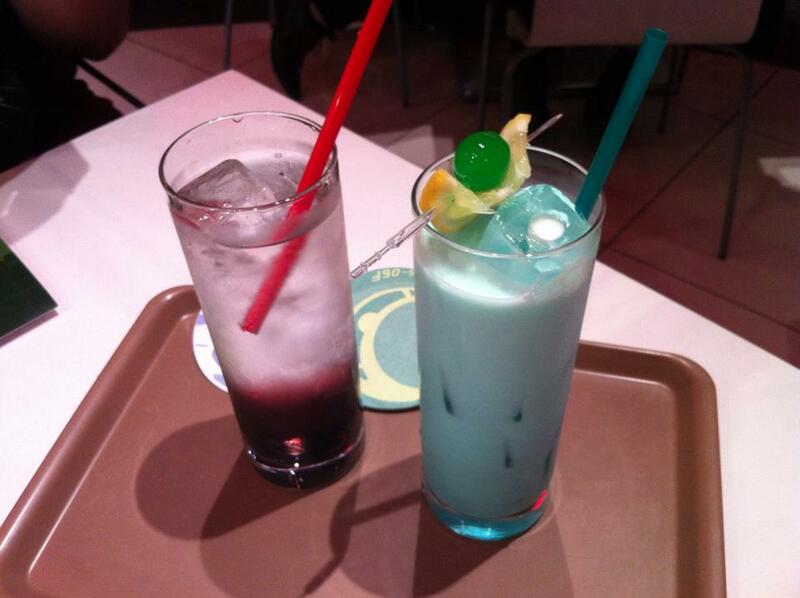 On the right is the Kira Yamato – a milk based drink with blue curacao. My understanding has always been that blue curacao is alcoholic, but this is from the non-alcoholic drinks menu, so perhaps it’s non-alcoholic imitation blue curacao – I don’t know. It also tasted nothing like blue curacao.The Kira Yomato tasted like milk with strawberry flavouring. At 750 Yen (about AU $7.90), this is the most expensive glass of milk I have ever tasted. Would I recommend it? I realise that at this point I’m sounding pretty cynical. You probably would too, if you’d paid 750 Yen for a glass of flavoured milk. That being said, if you steer clear of the non-alcoholic cocktails and choose reasonably priced food from the menu, it’s not too bad. 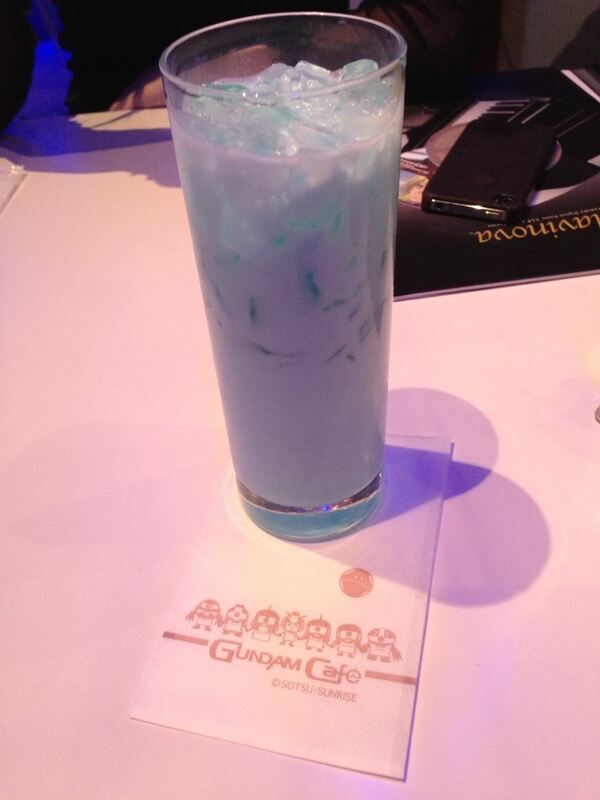 If you’re a Gundam fan – especially if you’re heading to Akihabara anyway – then you may as well stop by the Gundam Cafe. There’s a little store there, too, where you can buy exclusive Gundam Cafe merchandise. It’s right near Akihabara Station, so the easiest option is to catch a train, and then walk from the station. 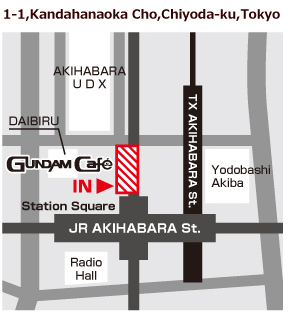 A map of where to find the Gundam Cafe in relation to Akihabara Station, from the Gundam Cafe website. 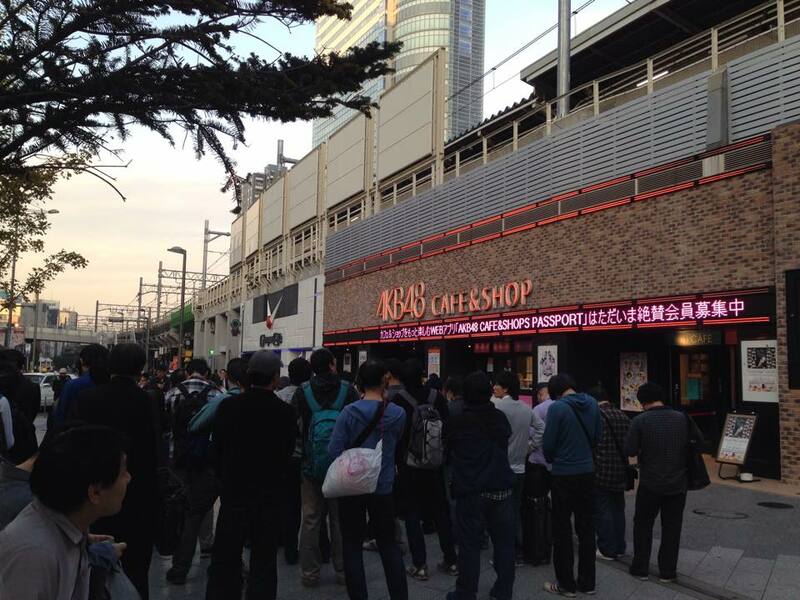 It’s right next door to the famous AKB48 Cafe. If there are huge crowds of men lined up, they’re there for the AKB48 Cafe, so walk around them to find the entrance to the Gundam Cafe. Note: Whilst the Gundam Cafe in Akihabara has both a smoking and a non-smoking section, the smoke does manage to find its way into the non-smoking section. If you’re asthmatic and/or dislike cigarette smoke, you might want to avoid this cafe. The AKB48 Cafe right next door is entirely non-smoking, so if you’re simply after a themed cafe in Akihabara, this would be an option to consider.